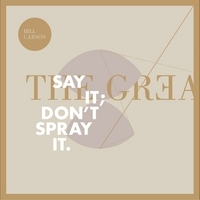 The Great Whale -or, Say It; Don't Spray It. written by Bill Carson with the exception of "Santa Monica," which was assisted by MTR, and "The Miller's House," which was written with Nathan Koci, Philip White, and Ron Wiltrout. All titles 2009 Unconscious Balloonist Music BMI. mixed by Josh Kaler at Hello Telescope in Charleston.